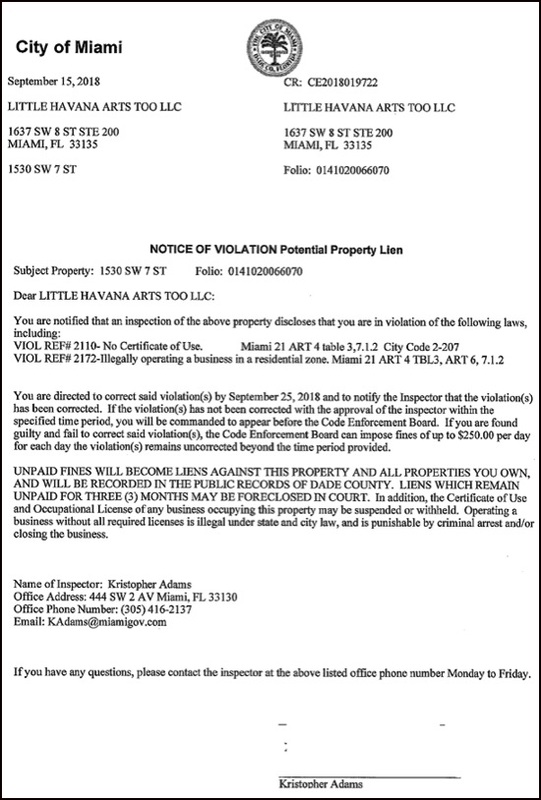 I obtained this text message as a result of a public record request, but to date, even after another request, the City has not provided me any documentation of what happened after the City Manager received this message, and the issuance within an hour of so after, of this Code Violation for the property at 1530 SW 7th Street that Carollo references above. It's telling, that in the middle of the night, Colonel Klink wasted no time in acting on Carollo's text message, and that within an hour or so a code violation involving alleged illegal parking was issued, even though there is some question of whether the property cited was being used illegally. The BLUE arrow points to Ball and Chain. Last night, Commissioner Joe Carollo, was photographed and videotaped behind the Ball and Chain nightclub, in what appears to have been an effort to obtain evidence that he could use for the presentation that he announced that he would be making at the next City Commission meeting about the the illegal activities of the owners of Ball and Chain, and the failures of the Code Enforcement Department to act like he wants them to act. 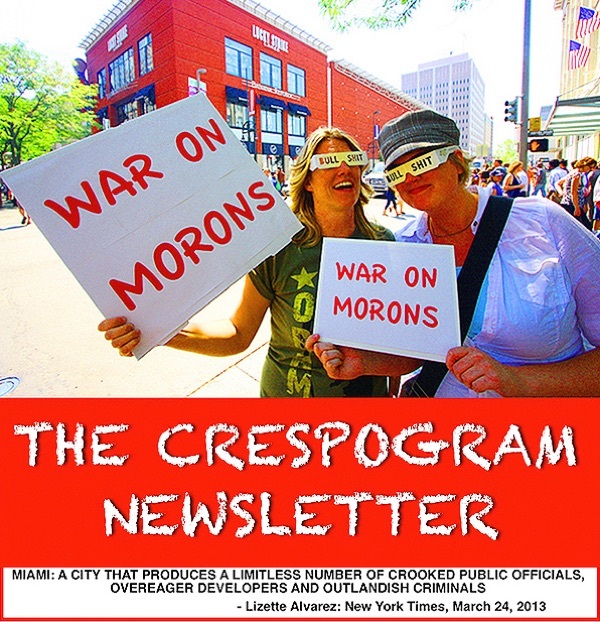 Carollo has always made a point of proclaiming that he's a stickler when it comes to the application of the law, but in truth, he only makes a big deal of the laws - especially code enforcement - being enforced when they provide an opportunity to punish or get even with his enemies, as evidenced by the fact that even though he's the Commissioner for all of District 3, he has pretty much limited his attention regarding code enforcement issues to a couple blocks of SW 8th Street. 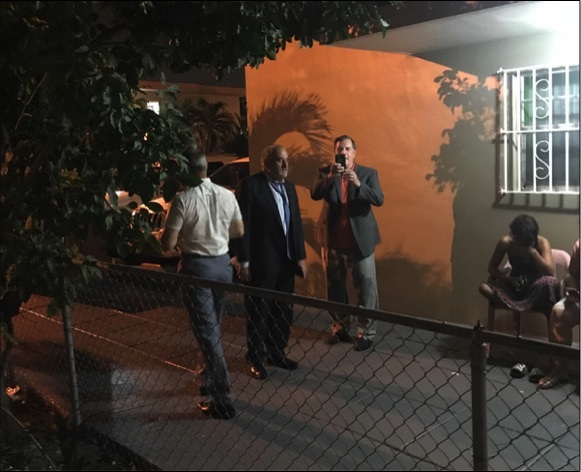 In the 10 months that he's been a City Commissioner you've not heard him once say a word about code enforcement issues on Flagler Street, or any other part of his District other than the area between 15th and 17th Avenue on SW 8th Street. You can see that here in this portion of last week's Commission meeting when he informed the Chairman that he wanted time to present evidence of malfeasance and a failure of compliance by the Code Enforcement Department. Carollo, as the recent Ethics Commission close out reported revealed, is obsessed with Bill Fuller and his properties, and in continuation of that obsession on September 15th, after he left the Chief of Police's Gala Ball for the Police Athletic League, he didn't go home like most of the other attendees did, but instead went looking for illegal parking violations around Fuller's club that he then sent in a text message to City Manager, Emilio "Colonel Klink" Gonzalez. The property is not used for commercial parking, but rather it is used for the private parking for the employees of Ball and Chain. To appreciate further the selective process of enforcement being engaged in by the city, I have been told that even though as a result of Carollo's successful efforts to do away with the Code Enforcement Special Masters, which immediately contributed to a growing backlog of cases that are now exclusively heard by the Code Enforcement Board, this case has received priority and is scheduled for a hearing in the next couple weeks. Which now brings us to last night activities. 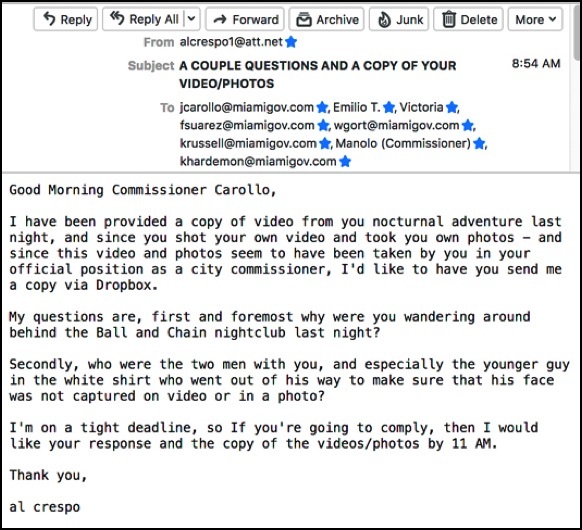 This morning, after I downloaded a copy of last night's video shot by an employee of Ball and Chain, I sent an email to Commissioner Carollo asking for a copy of the video and photos that he took, and also asked him to identify the individuals who were with him, especially the guy in the white shirt and grey pants who you can see in the top photo, and who as the video below shows went out of his way to make sure his face was not captured in video. If anyone can identify this guy from the photo at the top, I'd appreciate it. I also reached out to Bill Fuller because I wanted to talk to whoever shot the video to get some explanation of the what and why, and instead I was provided a copy of this incident report written by that individual. The video only show 2 other men, and therefore it seems that whoever the 3rd other person was disappeared as quickly as he could. Below are the 3 videos that the Ball and Chain employee shot last night. Video 1, is the confrontation that took place between him and Carollo. Play close attention at the beginning of he video and you will see the 2nd guy in the white shirt double back to stay behind the tree so he can not be videotaped. Video 2, is a brief interview of the residents that Carollo questioned where the guy says they have no problem with the music, and hat Carollo told them that the parking was illegal. 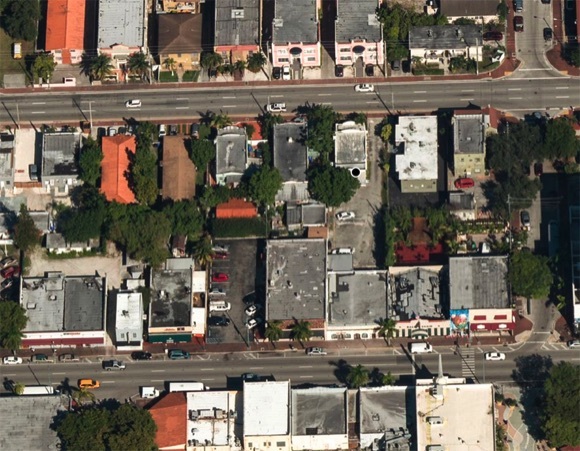 Video 3, is Carollo crossing SW 8th Street and walking towards his house - since he got elected Carollo moved from the apartment that was the basis for the lawsuit filed against him for not living in the District - and he's moved to SW 10th Street, between 15th and 16th Avenue. 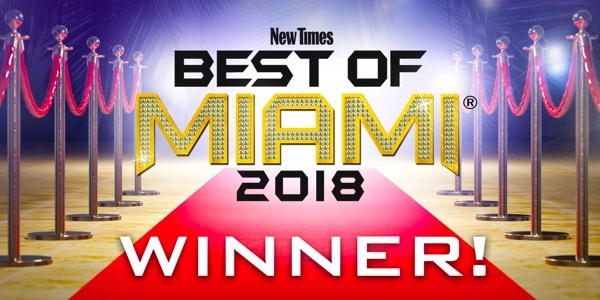 Watch the video to the end, and see what Carollo does. NOTE: I brightened Video 1 because it was too dark to see Carollo, and I reformatted all 3 videos to vertical from horizontal.